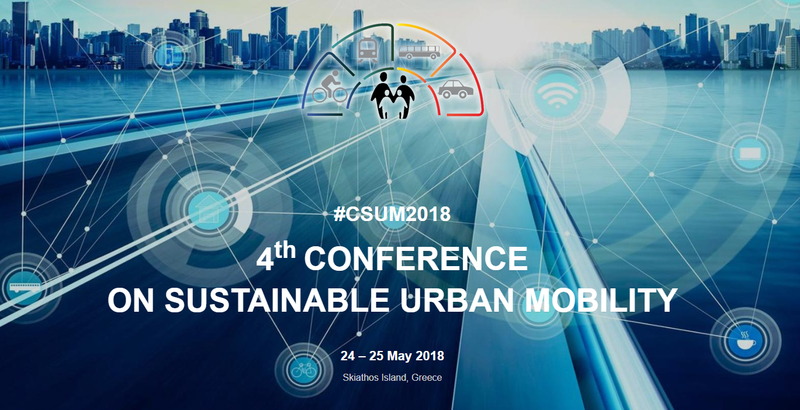 On behalf of the Organizing Committee, we are pleased to invite you to the 4th Conference on Sustainable Urban Mobility – CSUM2018 to be held in Skiathos Island, Greece, on 24 – 25 May 2018. The theme of this year’s Conference is: “Data analytics: Paving the way to sustainable urban mobility”. The Conference proceedings will be included in a USB flash memory during the Conference and will be published after the Conference in a proceedings book indexed in Scopus, by a Publishing Company. A selection of papers will be considered for further review and publication in the International Journal of Social, Behavioral, Educational, Economic, Business and Industrial Engineering of the Word Academy of Science, Engineering and Technology – WASET (indexed in ISI), and the De Gruyter open access Transport and Telecommunication Journal (indexed in SCI and Scopus) of the Transport and Telecommunication Institute. You are invited to submit an abstract limited to a maximum of 300 words on any of the Conference topics. Abstracts should be submitted via EasyChair until 29 September 2017 through the Conference website: http://csum.civ.uth.gr/. Looking forward to receiving your submissions!